1. Apexity, Inc. reserves the right to refuse service or cancel existing accounts for any reason at any time. In the event of an account cancellation by Apexity or the customer, after any initial trial periods as stated on our websites Apexity will not issue a refund. 2. Apexity, Inc. reserves the right to change fees at any time. 3. Apexity, Inc. is not responsible for lost revenue, traffic, or data caused by server down time or failure, domain name transfers, or any other error - mechanical or human. 4. Customers of Apexity are forbidden from partaking in an "abusive practice." The following is a list of current abusive practices. Apexity reserves the right to add to or modify this list at any time. Sending unsolicited commercial e-mail with your account. Also, a violation is incurred if any unsolicited email is reported relating to your domain with us in anyway, regardless of what SMTP (outgoing mail server) was used to transmit the message. Upload, posting or reproducing in any way materials protected by copyright without the permission of the copyright holder. Uploading or creating any exploitable or aggressive materials on our shared webhosting platform is strictly prohibited. Any tools we locate that may be used to exploit the operating system, or any operating system, will result in immediate account termination. This includes eggdrop bots, buffer overflow programs, devices to attack or harass other internet users, and many other items. Apexity, Inc., reserves the complete discretion to determine what materials fall under these headings. Participating in an abusive practice will lead to an immediate account termination without prior notice or refund of any pre-payment. 5.) Customers of Apexity are to use our email services as an means of transport between themselves and their recipients. Our shared email servers are not storage servers. We are not responsible for any loss of emails if you abuse this policy as we reserve the right to purge an Inbox if that email account is using more than 5 MB of space. This policy is in effect because of the sheer risk of what email can do to a shared server. The memory/CPU overload & lack of resources it can cause can lead to putting a other sites out of business. 6.) Customers of Apexity are bound to all system policies not specifically listed within this agreement. A list of all policies can be found at http://www.Apexity.com/support/. Violation of any of these system policies will result in an immediate account cancellation without refund or access to hosted files. 7.) This agreement is not assignable or transferable without the express written consent of Apexity, Inc. 8.) 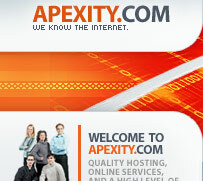 Apexity, Inc.'s hosting services may only be used for lawful purposes. Transmission of any material in violation of any U.S. or any state regulation is prohibited. This includes but is not limited to: copyrighted material, material legally judged to be threatening or obscene, or material protected by trade secret. The client specifically agrees to indemnify and hold harmless Apexity, Inc. from any claim resulting from a breach of these terms, and/or the use of the service which damages another. 9.) This agreement shall be governed by the Laws of the State of Florida. Any action in regard to this agreement or arising out of its terms and conditions shall be instituted and litigated in the Florida District Court for Hillsborough County. Each of the parties consents to jurisdiction in such Court and agrees that service of process as provided by the states and rules of civil procedures of Florida shall be sufficient. 10.) This agreement constitutes the entire agreement between the parties hereto.